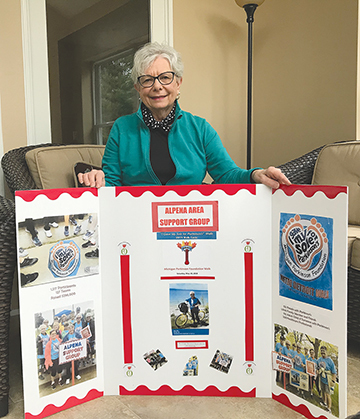 The Klein family is settling into their new residence at the 40 Mile Point Lighthouse, after Eric Klein was appointed to the position of lighthouse keeper in January by the Presque Isle County Board of Commissioners. Pictured from left to right are Eric’s sister, Sabre, daughter, Cora, wife, Lisa, son, Anthony, Eric, and his son, Evan. 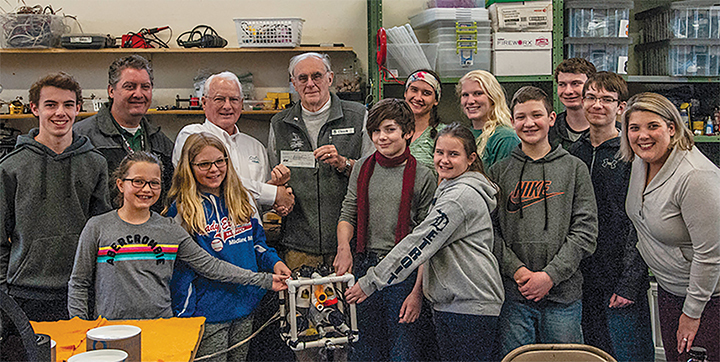 ROGERS CITY — For Eric Klein, being appointed caretaker of the 40 Mile Point Lighthouse feels more like a homecoming than it does a job. Klein remembers playing on the lighthouse grounds as a child when his father, Rick Klein, was caretaker. Klein said his father became keeper of the lighthouse in 1984 after a distant relative suggested he apply for the position. “We were the only family to apply for the position,” Klein said. His father remained caretaker until 1991, when he passed away. His mother, Karen, remained at the lighthouse until 1999, he said. After moving away, Klein said he never really thought about being a lighthouse caretaker, and that he wasn’t really into lighthouses at that time. 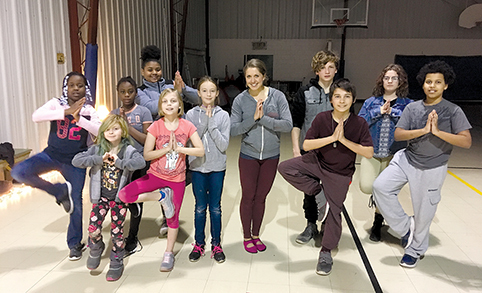 He married his wife, Lisa, in 1992, did some homesteading in Phoenix, Mich., and decided to move back to Rogers City to be closer to family about five years ago. 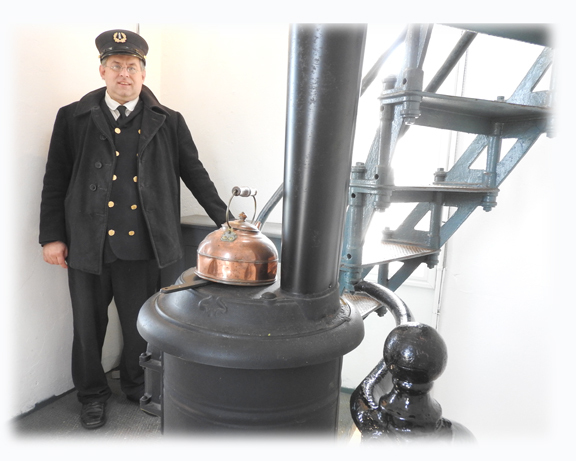 Eric Klein, caretaker of the 40 Mile Lighthouse, stands next to the coal stove used in the winter to heat the clockwork used to turn the light in the lighthouse. The teapot on the stove is ornamental. Shortly after, Klein ran into the lighthouse’s then-keeper, Neil Burchett, who told Klein he intended to retire. Intrigued, Klein started doing some volunteer painting and was soon appointed to the Presque Isle County Historical Society board. 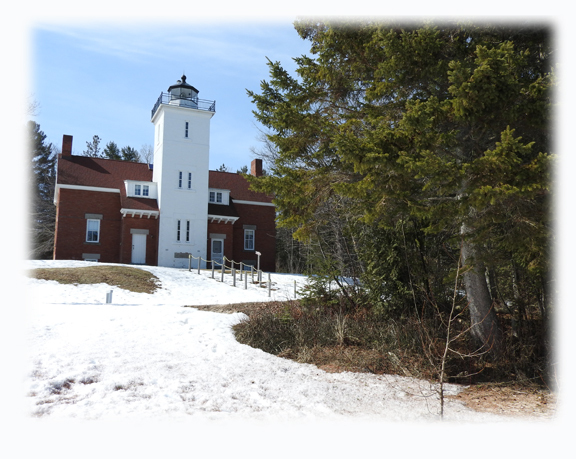 He was appointed caretaker of the lighthouse in January by the Presque Isle County Board of Commissioners. Klein admitted moving back into his childhood home was a bit “surreal” at first, but said he’s excited to be part of the building’s history again. The 40 Mile Point Lighthouse is pictured from the shoreline. The lighthouse was built so ships would have continuous light along Lake Huron’s shoreline. Cora said that, when her dad first brought up the idea of being the caretaker, the family thought it would be fun. She said they’d heard the stories of how her parents used to play at the lighthouse when they were growing up. 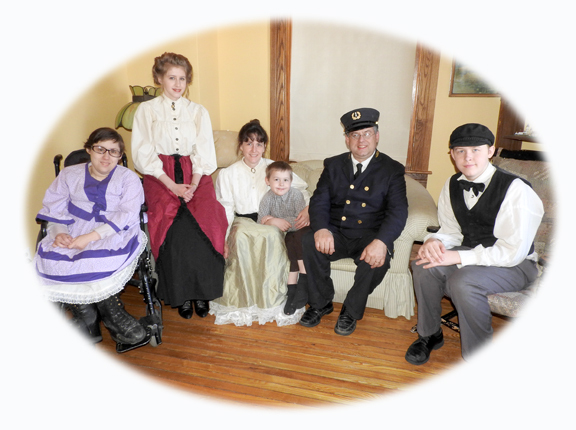 As the lighthouse caretaker, Klein and his family get to live at the lighthouse in exchange for maintaining the county park and having a presence there. Klein said his daily tasks include things like taking care of the lawn, keeping up the bathrooms, and emptying the trash. Klein said he is also taken with the history and mechanical nature of the lighthouse — the old lenses, the clockworks that would turn the lenses, the fog signals and boilers, steam engines and whistles. 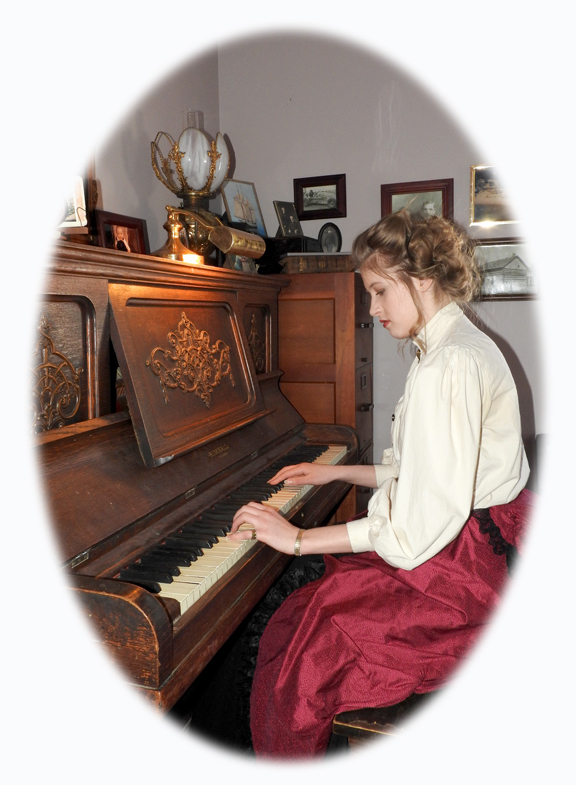 Cora Klein plays piano in the portion of the 40 Mile Point Lighthouse she lives in with her family. Her father, Eric Klein, was appointed as the lighthouse’s caretaker in January. One of Klein’s favorite features of the lighthouse is the Fresnel lens, which was installed nearly 100 years ago, on May 15, 1919. The lens is significant, because it allowed the light to be visible over greater distances. 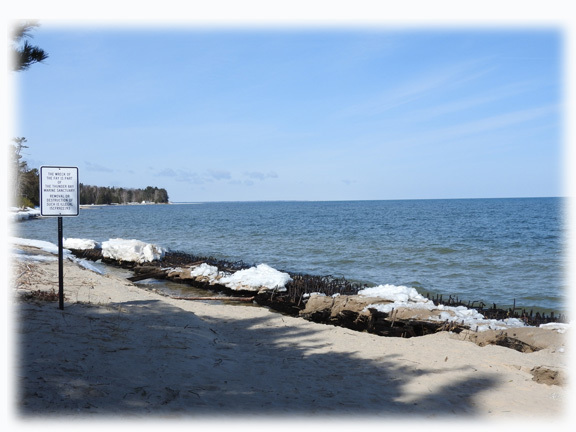 Klein said that, while some lighthouses are built to mark a harbor entrance or warn boats of reefs or islands they don’t want ships to run into, the 40 Mile Point Lighthouse was constructed so ships would have continuous light along Lake Huron’s shoreline. Klein said the lens is one of the only known Fresnel lenses operating on Lake Huron today, and boats still use the lighthouse to let them know their location. Captains on freighters, navigating with modern equipment may use the lighthouses when that equipment fails, Klein said, and small boaters rely on the light the most. Klein said things are going to be a little different for the family this time around, as the lighthouse didn’t have the historical society or gift shop and wasn’t open to the public when he previously lived there. One of the unique features of the 40 Mile Point Lighthouse is that visitors can see the wooden side of the Joseph S. Fey shipwreck that washed ashore about 150 feet from the lighthouse. Last year, 9,000 people signed the logbook when they visited the lighthouse. “We haven’t experienced living in here when the museum is operational, yet, so we’re going to have to get used to people next door,” he said with a chuckle. Lisa said they will celebrate the 100th anniversary of the lens this year, although a date has yet to be set. 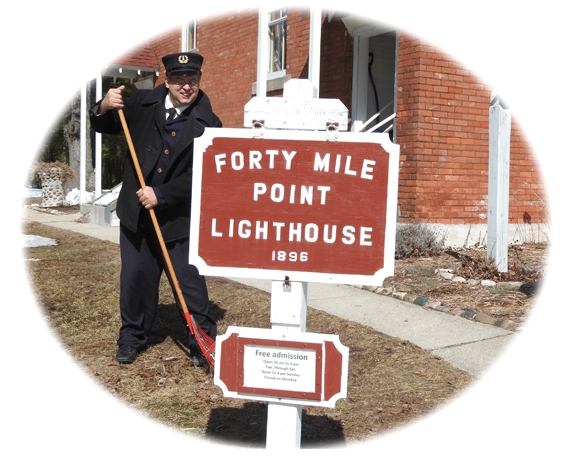 Eric Klein, newly appointed caretaker of the 40 Mile Point Lighthouse, tends to some yard work in front of the lighthouse, 7323 U.S.-23 N.